Climbing for Two: to climb or not to climb? One of our first considerations when thinking about trying for a family was would I have to stop climbing? There seems to be a lot of conflicting advice (and some rather strong opposing views) on the internet on the subject of rock climbing during pregnancy. General medical opinion appears to be that any activity where falling is likely should be avoided, as well as contact sports, anything that could result in even mild abdominal trauma and loaded twisting movements. The reasons for this are obvious – clearly I wouldn’t want to cause any physical damage to either myself or our baby, but on the other hand, there are definite benefits from climbing, both physical and psychological. And if pregnancy yoga is safe, then surely some aspects of rock climbing (or ‘yoga going upwards’ as I like to call it) could be ok? Traversing – we decided that easy traversing as an alternative warm-up routine would be ok.
Bouldering – we immediately decided bouldering was out because of the fall risk. Top-roping – this, we considered should be ok using a full body harness, as long as it was adapted to avoid situations where a swing might occur (i.e. any largely meandering routes) and Robin was careful to make sure he belayed me attentively. Lead-climbing – Climbing magazine said that “your foetus is well protected in the first trimester, but a big fall could still cause a miscarriage. Many women choose to keep leading, but select your routes carefully to avoid serious falls”. However, on balance, it seemed sensible that if bouldering was a no-no, then lead climbing should be too. Seconding – our decision here was that seconding on outdoor climbs would be alright, but only if the indoor climbing was going well and the routes picked were well below grade. Well, Baby VdH is now 5 1/2 months baked, and this blog post is to really share how we’ve been getting on, and what I’ve found the experience of climbing when pregnant is really like. Month one was business as usual as neither Robin or I knew we’d been successful. I had been taking a bit more care when climbing, however, just in case, and had been sure to stay in control when bouldering. As soon as we realised that we had an embryo on the go the rules were imposed despite the pregnancy not yet feeling very real at all. I managed to keep up climbing despite having morning sickness, although some sessions were heavier on the belaying than the climbing. My regular harness was still fine as my bump had yet to show itself and I was relatively comfy despite some thickening around the waist. The main thing I noticed was how different my body felt when climbing. I could really feel that my back was weaker where the ligaments had softened, and the way my pelvis sat was slowly shifting which changed how I held myself when standing and climbing. The main risk was causing damage to my lower back by over-loading it, or putting weight on it while in a twisting motion. I found that by listening very carefully to my body and moving in a slow and controlled way, I could sense when anything was likely to strain my back and was able to back off any climbing move without it being an issue. At four months I finally switched over to using a full body harness. I realised immediately that I would have been a lot more comfortable if I’d switched about 2-3 weeks earlier! It was such a relief to not have pressure around the waist anymore, despite still not having a bump. It took a little getting used to, primarily due to the tying in point being at chest height. Firstly, belaying was more physically tiring as arms needed to be held up fairly high, and taking in could only be done in shorter sections. Secondly, lowering from the top of a climb involved lying back to a much greater degree, which I initially found disconcerting. 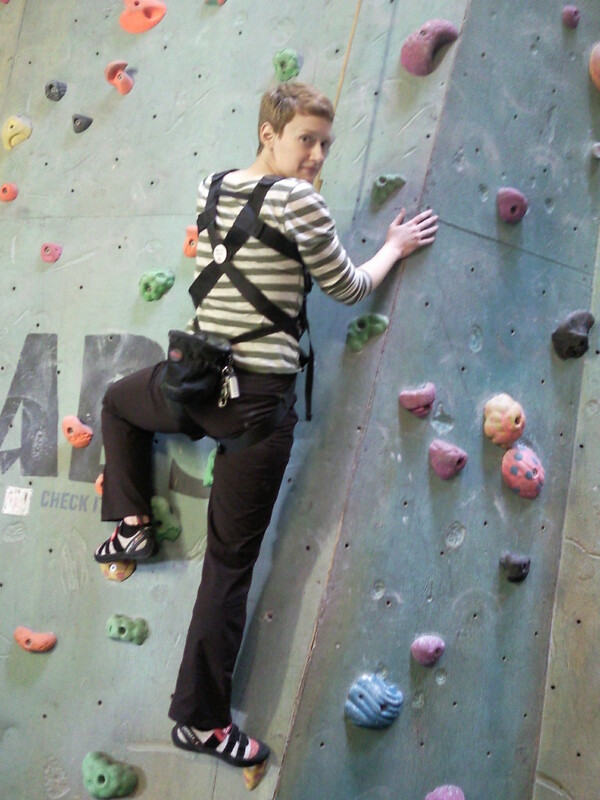 Climbing wise, I felt more energised in month 4, and even managed a few overhangs. I was quite surprised to still be climbing at practically my normal grade. How I’m anchored while belaying a leader. Safety during belaying: this wasn’t something I’d really thought about that much before. Despite Robin being quite a bit taller than me, we’d never bothered with ground anchors except when climbing outdoors as our weight difference was never much more than 10 kilos. Suddenly, the prospect of being pulled forwards into the wall if Robin took a fall took on more significance. Top-roping didn’t really worry us as I was narrowing the weight gap and Robin wouldn’t be taking large falls, but we had to rethink my belaying of his lead-climbing and start packing a long sling and several extra screw-gates. 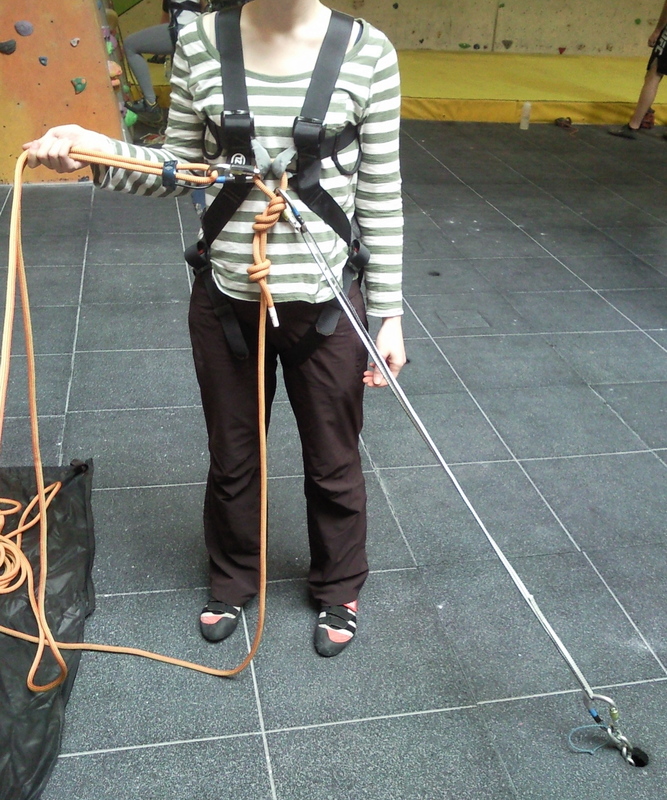 Using a full body harness: it took at about 3 climbing sessions before I got comfortable with using the new harness. Initially I was holding my body in it like a seat harness, which mean that the leg loops dug into me uncomfortably. Eventually, I realised that I had to use the whole harness, and sort of lie in it and, after I got used to the corresponding change in my centre of gravity, it was very comfortable indeed. It was a complete waste of time trying to fit the harness at home, because it didn’t shape itself around my body properly until I was tied into the rope with a slight upwards pull. Fitting it at the wall, I found that having the body set up slightly long (i.e. a tiny bit loose over the tops of the shoulders) allowed me to have enough unrestricted reach without feeling like I was going to fall out. Another thing I found was that I got stared at lots; mostly by men probably wondering why on earth I wasn’t wearing a normal harness. This made me feel rather uncomfortable until Robin suggested attaching my ‘baby on board’ badge* to the back, turning confused stares to friendly smiles. Overall climbing during pregnancy so far has been quite a positive experience, and much easier than I’d expected. I plan to keep climbing as long as possible while Baby VdH grows, and post again later in the year. * London Underground provides pregnant Londoners with these badges to encourage people to give up their seats on trains for pregnant women. Sometimes they work, often they don’t. UPDATE: 9 September 2013 – I’ve posted an update on my climbing when pregnant which you can see here. Reblogged this on Climbing Mum. Have reblogged (also linked on my Facebook page). I did the opposite, I only bouldered but kept it to V3 and below. I didn’t think of the full body harness until I was quite big and immobile! Thanks for the re-blog and the link – that’s really good of you and I’m pleased that you liked the post. Yes – we can sell it. The price would be £40 plus the postage and packing. Would you like it with or without the Baby On Board badge?